DSL models feature adjustable power settings, which deliver all-valve tone & feel, at any volume, from bedroom to stage. The technology adjusts power to the valves, instead of just turning off valve stages, allowing the amp to remain articulate & dynamic. Some innovative tweaks to the EQ circuitry have given the DSLs even greater tonal flexibility. The EQ section of the new DSLs can deliver exactly what your ears are looking for. Our partnership with Softube(R) has led to the creation of award-winning plug-ins, as well as exceptional tone in our CODE digital amps. The same team is responsible for the development of the emulated output feature, found in the DSL series. Both the headphone out, and line out on the DSL models boast incredibly accurate emulation of our famed 1960 cabinet. Overall: This is a great practice amp with the onboard 10” speaker, and also sounds incredible when ran through my buddy’s 4x12 Marshall cabinet. If you don’t like the factory speaker, Celestion makes some very fine replacements you can pop in. If you want to play through a bigger stack, unplug the onboard speaker and run a cable from this combo to the stack. If you want that Marshall DSL tone, an amp from this line is definitely what you’re looking for. Some of the features that made this the right amp for me include:- low power mode: when engaged, I can dial the gain as high as I want without notifying the rest of my apartment complex that I’m rocking out. Conversely, don’t let the five watt power rating deter you if you’re after volume - you’ll definitely be able to cause a noise complaint if you so choose. 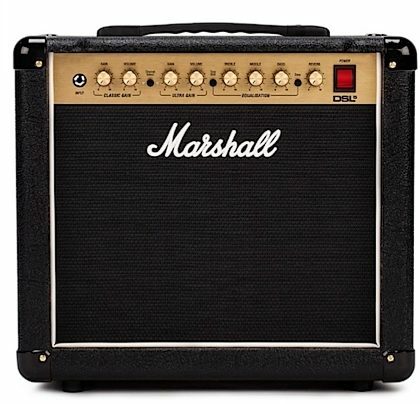 The selling point for me, however, was being able to dial in that Marshall tone at a volume one can speak over. Whether playing with the hot EMGs in my Les Paul, the even hotter humbuckers in my Blacktop Jaguar, the 490s in my SG, or the comparatively quiet Texas Specials and Atomic humbucker setup in my Strat, the cleans are articulate and the distortion is wonderful. This amp also takes my pedals, including my variety of dirt pedals (EHX Big Muff Pi for fuzz, a modified Boss DS1 for distortion, and an EHX East River Drive for OD) like a champ.- included foot switch: This was a fantastic bonus. The cabling on it is sufficient in length to play practically anywhere and still be able to switch channels without running across the room.- onboard reverb: While I don’t use it often, it’s much more articulate than I was expecting. Not in the same class as my EHX pedal, but definitely a nice added feature.- emulated line out: This is fantastic. No need for a direct box, no mucking about with a USB/FireWire/Thunderbolt interface when I want to jack in and record, no latency issues, and no mucking about with software effects to get my sound just right. A mini jack cable to the line-in on my laptop or DAW allows me to record my sound, off of my signal chain, with no issues whatsoever. I love it.- effects loop: this was something that my Orange Micro Terror lacked. While I don’t use it frequently, it is nice to have the option. Bottom line, if you want a worthy successor to the original Dual Super Lead in a package that won’t blow the roof off your house and would be sufficient for gigging small venues (which I have with this amp,) this is probably the amplifier for you. 5/5, would definitely recommend this or others from their DSL line.